Replicating the aura of a varsity locker room, the venue featured in-store stylists and grooming consultants to help customers mix and match different pieces. 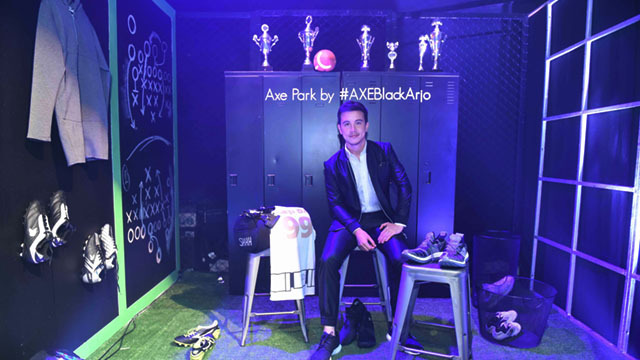 Arjo and his teammates were also present throughout the event to help guests finish up their look with a spray of Axe Black. As guests arrived they were greeted by stylists who took them on a tour of the different apparel available, including exclusive pieces by local retail brands The Ilustrados, Halo Halo, and the Shape Shop. Attendees also perused through other essentials, like Rocca wallets, Mist and Sip jugs, and special merchandise from Vans. His 10 showcased pieces were a mix of both local and foreign brands, but combined together created a look that was distinctly Arjo. “Through my concept store, I want to be able to introduce guys to the world of luxury sports wear - showing them that being athletic can also be classy, if done the right way,” says the actor. Of course, clothes are just the beginning. Let AXE Park’s grooming experts help you find the perfect hairstyle to complement your look. Paired with the right duds, you get the effortless, understated, high-style look that's embodied by Arjo and his concept store. Drop by the AXE Park from November 12 to 13 at Unit 27, Bonifacio Global City, from 11 a.m. to 6 p.m., and get the full experience.